Graduationstoles.net is supported by Stoles. Let us support you! Are you a specialist graduation stole vendor? Are you a wholesaler specializing in grad & Greek? Do you operate a physical or online shop selling grad & Greek? Do you run a print or embroidery workshop? Let us support you with quality products, rock bottom prices, excellent CRM and free value added services! We believe that there is no point to compete on price if you can't compete equally on quality. We found the best products available in the market, analyzed them, improved the satin fabric, the embroidery quality, the print and stitch work; increased the lining to effect a wonderfully rich drape and bumped up the color options to around 200 stock colors! We are the direct manufacturer with fully owned facilities in the Far East, utilizing low costs of manufacture, bulk discounted purchase of raw materials, and cost efficient technologies, communication & logistics. Manufacturing experience since 1998, In house quality control division, in house design department, in house logistics department and over 50 hard working, team playing employees. Guaranteed 24 hour email support + office hours telephone support. Full satisfaction guarantee that you can extend to your own clients. Link from our main web to attract clients in your geo location & increase your SEO for Google search. 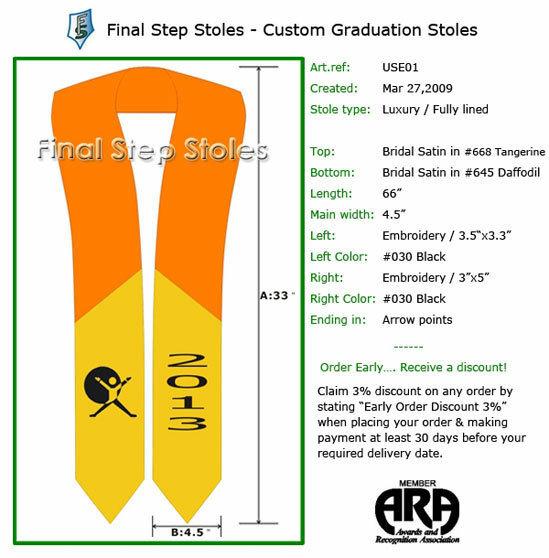 Sell graduation stoles made by and profit! Please visit our Page for Vendors and follow the links to your best source of the finest quality graduation stoles with the lowest prices on the web. Contact us at any time with your questions. Drop Shipping within the USA from graduationstoles.net. GraduationStoles.net can provide Drop Shipping services within the USA, sending the stoles directly to your clients.